Pre-construction work is under way with construction on the six stations due to start in the summer/fall 2019 and the APM fully operational in 2023. 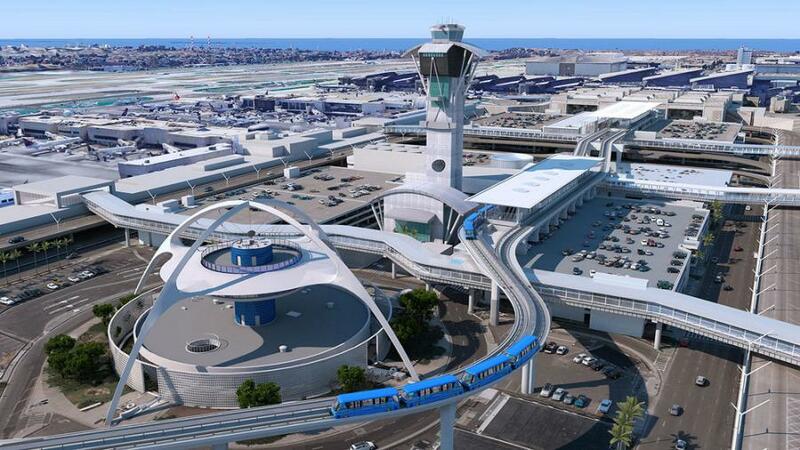 Los Angeles city officials broke ground last month on a $1.95 billion Los Angeles Airport transportation project that is expected to dramatically improve the travel experience for the more than 87 million passengers who move through LAX annually. The electric train Automated People Mover (APM) will operate on a 2.25-mi. elevated guideway with six stations — three outside the terminal loop and three inside. Pre-construction work is under way with construction on the six stations due to start in the summer/fall 2019 and the APM fully operational in 2023. "Everyone traveling to or from LAX should have access to modern, reliable public transportation that gets them to their destination on time," said Mayor Eric Garcetti. "The Automated People Mover is a historic investment in our city's transportation infrastructure — a milestone that will create middle-class jobs, reduce traffic congestion, and deliver a world-class experience for travelers." The first APM car will be delivered in late 2020. Major construction will be complete in mid-2022, at which point extensive multi-month testing will begin. The APM will be open for passenger services in early 2023. The APM will have nine trains, each with four cars with the capacity for up to 50 passengers and their luggage for a total of 200 per train. The trains will travel at about 47 mph and will be available at each station every two minutes with a total of 10 minutes travel time end-to-end. Cars will feature large, wide doors for easy access, as well as 12 seats designated for travelers in need. It will be free to travelers and operate 24 hours, seven days a week. Along with reducing traffic, the APM will use cutting-edge sustainability practices to reduce the airport' carbon footprint. The fleet will consist of 44 cars that are fully electric powered; 98 percent recyclable; and generate a portion of their own power through regenerative braking — an energy recovery system that allows energy to be used immediately or stored for later use. The command center and maintenance facility will generate nearly half of its power from solar energy and is designed to be LEED Gold Certified. The enhancements offset the carbon equivalent of 12 million vehicle miles driven. "The APM is an historic investment in Los Angeles' emerging businesses and workforce," according to the press release. "More than $580 million has been identified for local, small or disabled veteran-owned businesses, with $94 million commitment exclusively to local, small businesses right here in Los Angeles. The project will create more than 2,000 construction jobs, with 30 percent of those opportunities being reserved for residents of Los Angeles as well as highly impacted communities near LAX. Sixty percent of careers during the 25-year operations and maintenance phase are designated for local workers. "LINXS, the selected APM developer, has built partnerships with community-based organizations to focus on expanding the pipeline of workers, especially those from non-traditional backgrounds. Through more than $900,000 in investments, the project will create infrastructure career pathways for women, former foster youth, individuals in reentry and transitioning out of gang involvement, and persons with disabilities. HireLAX, LAWA's Apprenticeship Readiness Program, will be a key partner in this effort, as will other resources offered by the Building Trades and other industry partners." The train is the centerpiece of the Landside Access Modernization Program (LAMP), which also includes the Consolidated Rent-a-Car facility (ConRAC), the Intermodal Transportation Facility-West, a connection to Metro Rail via the future Airport Metro Connector Station and roadway improvements throughout the LAX area. 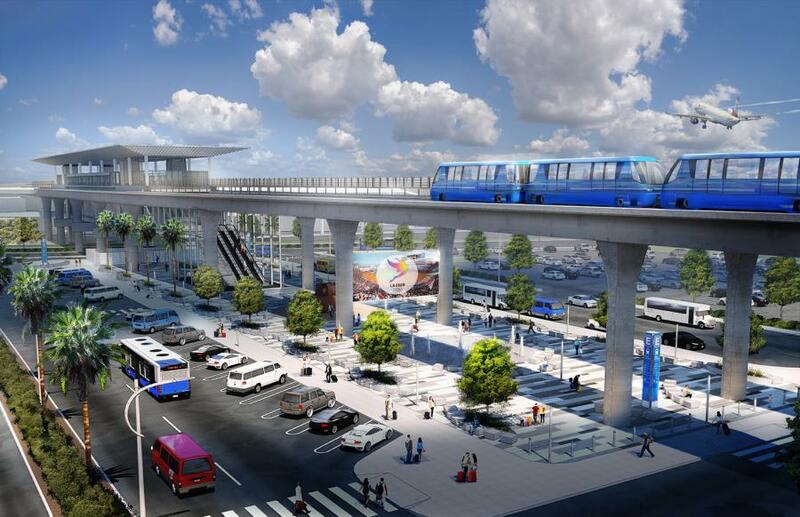 "Connecting Metro rail with the airport is going to be a game-changer — for travelers, and for the people I represent who live near LAX," said Councilmember Mike Bonin. "This project will take cars off of the road and improve the passenger experience by giving people a convenient, fast, and viable alternative to driving. 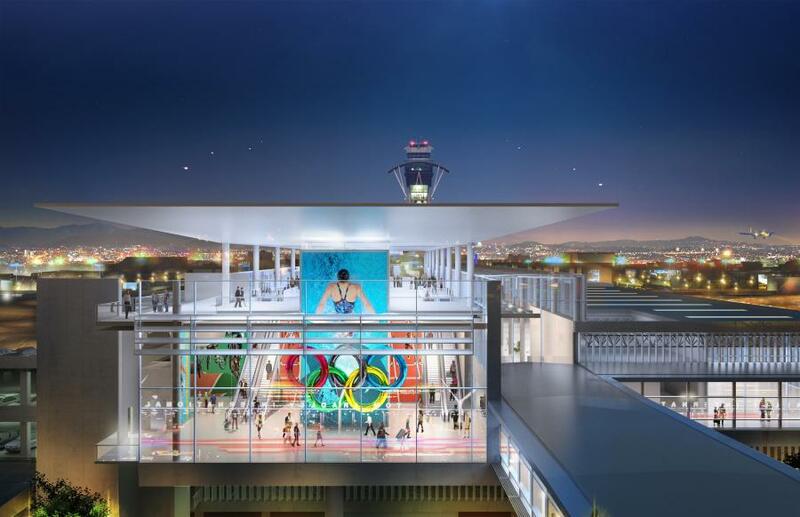 This is great for the traveling public, great for airport neighbors, and it's the next big step in moving Los Angeles and our airport forward."